Figure 1: Starting from (a) a collection of shapes and a few user-specified human shapes, (b) our method automatically deforms the models to fit the human shapes, and ranks the models using their deformation costs to produce a categorization of the input models with respect to their suitability to different human shapes (c). This paper examines the following question: given a collection of man-made shapes, e.g., chairs, can we effectively explore and rank the shapes with respect to a given human body – in terms of how well a candidate shape fits the specified human body? Answering this question requires identifying which shapes are more suitable for a prescribed body, and how to alter the input geometry to better fit the shapes to a given human body. The problem links physical proportions of the human body and its interaction with object geometry, which is often expressed as ergonomics guidelines. We present an interactive system that allows users to explore shapes using different avatar poses, while, at the same time providing interactive previews of how to alter the shapes to fit the user-specified body and pose. We achieve this by first constructing a fuzzy shape-to-body map from the ergonomic guidelines to multi-contacts geometric constraints; and then, proposing a novel contact-preserving deformation paradigm to realize a reshaping to adapt the input shape. We evaluate our method on collections of models from different categories and validate the results through a user study. Figure 2: Mapping of ergonomic guidelines to geometric constraints. For chairs, we derive four types of constraints, namely, height, width, length, and angle, as shown (a). The dotted arrows indicate the specifications from the skeleton shape/pose. Our method provides a quick view of how a shape can be altered to accommodate a specified avatar pose that abstracts both the human shape and desired configuration (b), by modifying human body’s shape attributes (e.g., leg length, body length) and poses leads to different styles of chairs. 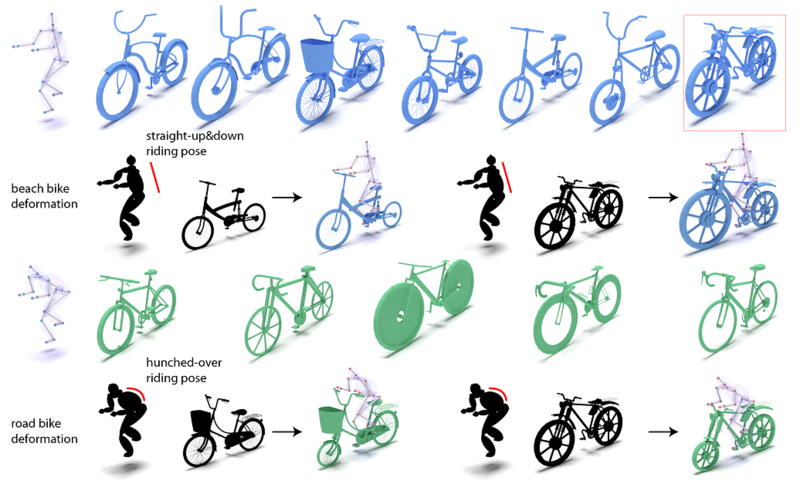 Figure 3: Clustering of a set of 12 bikes using 2 annotated poses: upright bike and road bike riding poses. Cluster membership resulting from the classification is indicated by corresponding colors. 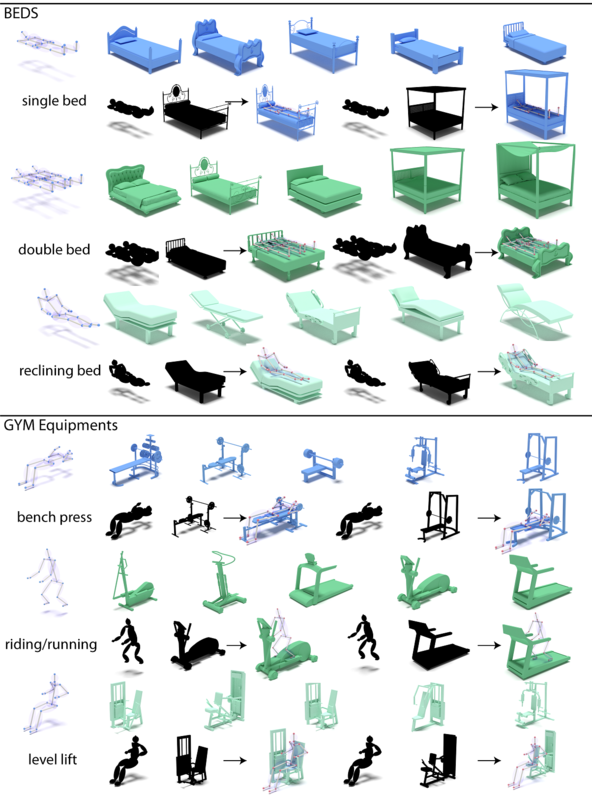 Figure 5: Clustering of a set of 15 beds using 3 annotated poses: single bed, double bed, and reclining (top) and of a set of 15 gym equipments using 3 annotated poses: bench press, riding/running, and level lift. Cluster membership resulting from the classification is indicated by corresponding colors. Not all the models are shown. We would like to thank the anonymous reviewers for their constructive comments and Melinos Averkiou for proofreading the final version of the paper. We thank Moos Hueting and all users for their help on the user study. This work was supported in part by the ERC Starting Grant SmartGeometry (StG-2013-335373).